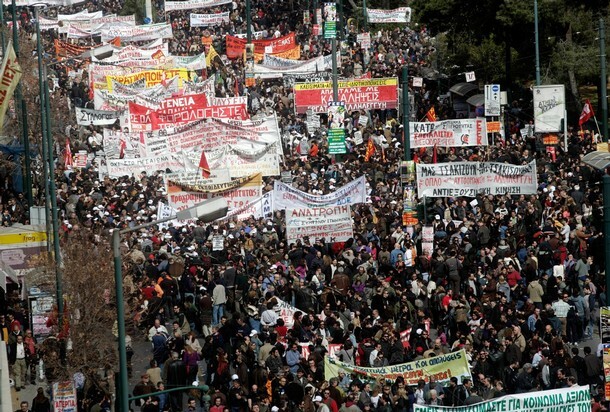 A united front of the left and sustained mass mobilisation are desperately needed in Greece. May 16, 2012 – Links International Journal of Socialist Renewal -- This article does not aim to give a full account of the current Greek political crisis. Rather, the crisis will be discussed with a focus on the failure of the Greek left to form a united front in the hour of need of the masses, with a historical look at the nature of the Greek left and the parties involved in it. The sensational outcome of the May 6, 2012, Greek elections, in which SYRIZA, a coalition of left-reformist and radical left organisations, gained nearly 17% of the vote, second only to the right-wing New Democracy (ND) party, comes on the back of the catastrophe being imposed on the Greek working class as it is forced to pay for the crisis of Greek and European capital. This catastrophe has resulted in Greek workers and pensioners, already on some of the lowest wages and social security entitlements in Europe, see their wages and payments directly cut by as much as 40% over the last few years. The “debt crisis” which this austerity is supposed to pay for is of course the debt accumulated by their capitalist class enemies and the endemically corrupt state under its twin dinosaur parties of austerity, New Democracy, the major party of the capitalist class, and the one-time vaguely social-democratic PASOK party. One important part of this debt was caused by the state’s purchase of a few billion dollars worth of military rubbish via NATO in recent years. The key issue has been the “Memorandum”, the brutal austerity and wage- and job-cutting package, imposed on Greece by the ‘Troika’ (the European Union, European Central Bank and International Monetary Fund) to squeeze workers and poor to “pay back” German and French banks. Both of the twin ruling parties have supported and imposed this memorandum, and as a result their votes have crashed from 33% to 19% for ND and 43% to 13% for PASOK, effectively wiping out the entire post-WWII order of two-party trickery. Combined, the vote for left-wing, anti-memorandum parties was some 27% -- 17% for SYRIZA, 8% for the sectarian-Stalinist Communist Party of Greece (KKE) and 1.9% for the Front of the Greek Anti-Capitalist Left (Antarsya), a smaller coalition of radical left organisations. Another 6% voted for the Democratic Left, a right-wing split from SYRIZA that wants to soften the austerity package but believes total rejection will get Greece kicked out of the EU (which they see as a fate worse than death). If these misguided but nevertheless left-leaning votes are also counted, one third of the electorate voted for parties associated with the traditional communist movement in one form or another, a considerably higher result even than the huge 25% vote for the United Democratic Left (EDA, the front group for the then illegal Communist Party) in 1958, which sent shock waves around Western capitals. In other words, in this situation – a “Year Zero” situation for the literally hungry masses – these masses handed their votes to SYRIZA, and secondarily to the KKE, with the mandate for them to take power, reject the memorandum, reject austerity, restore their livelihoods and do so by turning the tables on the Greek plutocracy, those who actually still have their bucket loads of cash despite the “crisis”, while telling the German-French plutocracy to shove off. Yet it is in such a context that the Greek left now seems unable to form a united front for the salvation of the people. The responsibility for this lies mostly, if not entirely, with the spectacular sectarianism of the KKE, which has point blank refused to join a united front with SYRIZA. More than that – criminally – the KKE has refused to even talk about it. In a quasi-reenactment of Stalin’s Third Period disaster in Germany – when the German Communist Party was ordered to refuse any joint work with the German Social Democrats against Nazism, indeed the Social Democrats were declared “social fascists”, allowing the Nazis to walk into power unimpeded – the KKE claims it will not work with SYRIZA who it denounces as social democrats who will inevitably sell out. But if history repeats itself first as tragedy and then as farce, then the tragedy being prepared by the KKE is based entirely on farce. For anyone aware of modern Greek history, the idea of the KKE having some principled left position opposed to collaborating with social democrats or even neoliberals and right-wing nationalists is a fantastic joke. While there is much to validly criticise about the program of SYRIZA’s leadership group, as a whole the SYRIZA coalition is light years to the left of the German Social Democrats of the 1930s, let alone the neoliberal “social democrats” today, and the only actual revolutionary policy in such a dire situation is to “take the bull by its horns” and form a united front with SYRIZA around the most immediate needs of the working class, and work with the more radical left components of SYRIZA in a non-sectarian fashion to challenge its leadership to keep left and to move further left as the ensuing crisis will inevitably demand. But the idea of the KKE working in a non-sectarian way with anyone on the left is like the idea of a pro-Palestinian position emerging from the White House. In all the mass movements against the class war being imposed by the rulers over the last few years, the KKE has made sure to join no one else and only organise its own actions. Worse than that, the KKE has vigorously denounced militant actions by any left forces outside of its control; indeed, for all its “left” rhetoric now, it has deployed its cadres to effectively act as marshals defending the state against actions by enraged and militant protesters. In terms of sectarianism towards the left, militant and revolutionary forces in Greece, the KKE has been nothing but absolutely consistent. “Consistent”, however, is a funny word. One thing important to understand about SYRIZA is that its left momentum today has been partly helped by the split of its most right-wing, social-democratic component into the “Democratic Left” as noted above. And it is important to know that the one and only section of the left that the KKE has ever actively collaborated with was precisely those who now make up this group, historically the “right-Eurocommunists”. And also with PASOK and New Democracy. In other words, the KKE has collaborated with everyone but the left. To explain all this, a little history is necessary. The KKE has historically played a large part in Greek politics since its historic role of leading anti-Nazi resistance in WWII, always making up a solid bloc of support, measured in double figure votes, just after the traditional right and centre blocs of the two-party trickery. When the traditional Communist parties internationally began to split following the 1968 Soviet invasion of Czechoslovakia and the rise of the radical new left, the Greek party also split. The majority remained pro-Moscow and was called KKE (Exterior), while the more critical wing loosely aligned with the Eurocommunist current was called KKE (Interior). The dominant party eventually dropped the “Exterior” tag and is now just known as KKE. However, the KKE (Interior) suffered its own right-left split in the 1980s, due to the contradiction between the reformist dynamic of Eurocommunism on the one hand and the left-radical dynamic of the new left and anti-Stalinist critique, especially in Greece’s strongly militant political environment, on the other. The left, who wanted to maintain and renovate a genuinely communist perspective, had the majority, and so kept the name KKE (Interior). The right minority split away and formed the Greek Left (EAR), dedicated to a “modern” left “discourse” and all that entailed (i.e., junking “old” ideas like class struggle etc.). The KKE drew closer to EAR despite its opposite positions on the Soviet Union, and in 1989 formed the Coalition of the Left and Progress (Synaspismos, the Greek word for “coalition”) to stand in the elections that year. It received a respectable 13% of the vote (most of it gained by the KKE’s historic working-class base). For future reference, the core of EAR is precisely what today forms the Democratic Left organisation. In the context of no party emerging strong enough to form a government on its own, and of the withering assault by the right-wing media on the ruling PASOK government’s (only too real) hyper-corruption, Synaspismos (i.e., KKE and EAR) agreed to take part in a coalition government with the victorious reactionary, neoliberal New Democracy party, under Konstantine Mitsotakis. Under the banner of “cleansing”, the right-left coalition would cleanse Greek society of the stench of corruption, apparently associated entirely with PASOK social democracy, until new elections at the end of the year. However, these new elections were inconclusive, so now Synaspismos – with a reduced vote as the working-class base punished it by swinging back to PASOK – agreed to form an “ecumenical” government with both New Democracy and (a presumably cleansed) PASOK. Under both the “cleansing” and the “ecumenical” governments, Synaspismos was essentially hostage to an emerging neoliberal program of restructuring the Greek economy. In the third election, New Democracy emerged victorious. The KKE’s coalition with New Democracy led to a split by a minority of the party and by the leadership and the majority of its youth organisation, the KNE, which strongly opposed this class collaboration. These forces formed a new left-communist party named NAR (New Left Current), which is today one of the key components of the radical left coalition Antarsya, alongside Trotskyist, state capitalist [those who believe the Soviet Union was a capitalist country] and left environmentalist groups. They have never had anything to do with KKE since. At the time they were laughably slandered by the media as hardened Stalinists for rejecting such a “modern” sophisticated idea as class collaboration with ND, which was highly ironic given that in the very same year, during the coalition with ND, the KKE hailed the Chinese regime's massacre in Tiananmen Square, whereas the KNE and KKE dissidents vigorously condemned it from a left-communist perspective, pointing to the capitalist restorationist policies of the Chinese leadership. Meanwhile, the KKE (Interior) also opposed this coalition with ND (and the ensuing one with ND and PASOK), leading to a semi-convergence with the KKE dissidents on class-struggle issues. It is today part of the constellation of radical left forces in the SYRIZA coalition. As for Synaspismos, it split back into its component parts. EAR on one hand drifted closer to PASOK, which had sought to “cleanse” its image from the stench of corruption by via “modernising”, i.e., junking aspects of its social-democratic past and holding itself up as a more human face to drive through the neoliberal “restructuring” of the Greek economy in line with the wishes of global capital, especially after it returned to government in 1994. As it was the KKE that quit the coalition, the small minority party EAR maintained the name “Synaspismos” despite it no longer being a coalition. Meanwhile, the KKE withdrew into a hidebound neo-Stalinist shell. In 1995, the KKE, which had faithfully followed Khrushchev, then Brezhnev, then Gorbachev, suddenly rediscovered that Stalin was allegedly one of the greatest Marxist thinkers and began doing absurd things in the 1990s like glorifying the 1930s purges. This seems to have little logic other than that of protecting its human “assets” from contamination by the rest of the radical Greek left, consisting of a dizzy constellation of Trotskyist, Maoist, anarchist and other far-left and revolutionary formations, and giving some justification to its abject refusal to work with anyone on the left. A key difference that emerged on the left was that of attitude towards the European Union. On the right, despite criticisms of the neoliberal Maastricht treaty, Synaspismos (i.e., EAR) attached itself to the view that membership of the EU was essential and part of Greece’s process of “modernisation” that could only benefit the left in terms of progressive social policy (despite the regressive economic “side effects”). The KKE by contrast made withdrawal from the EU a shibboleth to use in its struggle to maintain its relevance. While formally correct from a left standpoint, the obsession with withdrawal tends to look in a nationalist direction; its coalesces with the KKE’s traditional view of Greece as a colony of Western imperialism rather than a mini-imperialist power in its own right, and with its populist-nationalist “anti-monopoly” alliance. While the KKE in the early 1990s tended to take decent anti-nationalist stands on some issues, such as the Macedonian issue, for which it was vigorously condemned by the chorus of reactionary right-wing nationalism that dominated that decade, later in the decade the KKE adapted precisely to this same Greek nationalism. For example, it tended to echo the support given to Serbian nationalist leader Milosevic by the Greek ultra-right, Greek Orthodox Church, PASOK, New Democracy, indeed everyone except the principled left, in his Crusader-style anti-Muslim propaganda for an “Orthodox” axis against “the Turks” (i.e., Balkan Muslim peoples). With Milosevic and his cronies personal friends of both ND leader Mitsotakis and PASOK leader Andreas Papandreau, both of whom escorted him around Greece in their boats and mansions, and with Greek fascists proudly taking part in Serbian ethnic-cleansing campaigns, including in Srebrenica, there was little radical about this. When gigantic Greek rallies – supported by all Greek parties, from the far right, through ND and PASOK, to the far left – opposed NATO’s bombing of Serbia in 1999, the KKE ingratiated itself into the most right-wing chauvinist section of the movement by blocking with the Greek Orthodox Church and fascists in demanding that only Orthodox Serb refugees, not Muslim Albanian refugees (i.e., most refugees), be allowed into Greece. This fitted with the nationalist flavour of its anti-EU campaign. By contrast, the radical left preferred a perspective along the lines of opposing the European Union of capital but counterposing it to a Europe of workers, immigrants and the environment, a perspective of actually increasing connections across Europe of working-class struggles, of a united European working class to fight back against the united offensive of EU capital. As SYRIZA central committee member Haris Golemis explains, as opposed to “the dilemma that Greece should either accept the present political and economic framework of the EU (as supported by the PASOK and ND) or voluntarily get out of the Union – a demand put forward by KKE, but also some groups of SYRIZA … we believe that struggles and disobedience at the national level should be combined by coordination at the European level for the refoundation of Europe”. Golemis says the Greek crisis shows that “developments even in a small country of the Southern periphery can create a ‘butterfly effect’ so strong that it can shake European decision-making in its core”. While the KKE’s anti-EU position, despite its nationalist nature, was arguably to the left of the pro-EU position of Synaspismos, what the Synaspismos had going for it was its openness. This allowed a great many people well to the left of the Synaspismos leadership to find a home in a relatively large organisation that was still officially called a “coalition”, something they could not do within the KKE. This produced a dynamic within Synaspismos in conflict with the right evolution of the leadership group. These leftist elements of Synaspismos further valued cooperation with the more radical left outside the organisation precisely in order to counterbalance the evolution of its right-wing leadership towards irrelevance (who needs PASOK-lite when you can have the real thing?). Throwing itself into the anti-globalisation movement further broadened the base of Synaspismos. In this context, SYRIZA (Coalition of the Radical Left) was formed in 2004 between Synaspismos, its dominant and most reformist component, and a range of parties to its left. These included: the new incarnation of the KKE (Interior) known as Renewing Communist Ecological Left (AKOA); the Internationalist Workers Left (DEA, a state-capitalist group associated with the US International Socialist Organization); the Movement for the United in Action Left (KEDA, an anti-sectarian split from the KKE); Active Citizens, a party formed by Greek anti-Nazi resistance hero Manolis Glezos. They were joined later by the Communist Organisation of Greece (KOE, a militant anti-sectarian development out of the Maoist tradition; the left-environmentalist Ecological Intervention; the Democratic Social Movement (DIKKI, a populist left split from PASOK); another small PASOK offshoot called the Unity Movement; and for a time Xekinima, the Greek section of the Committee for a Workers International, along with a sprinkling of tiny left groups. Thus to see the current SYRIZA coalition as simply an extension of the old Synaspismos and its left-liberal evolution misses the point entirely. From the start there was tension between the Synaspismos leadership and its radical left allies. These tensions led to the election of Alekos Alavanos, who strongly supported the alliance with the radical left, as president of Synaspismos to replace Nikos Konstantopoulos, the leader associated more than anyone with rightist direction of Synaspismos since its foundation. The rise of the current leader, Alexis Tsipras, who has a long tradition of non-sectarian militant activity, is a further step in this direction. These tensions inside Synaspismos were resolved when Konstantopoulos led the “Renewers” (i.e., “modern” left liberals) out of Synaspismos and out of SYRIZA to form Democratic Left in 2010. As such, what remains of Synaspismos is rather different to the old EAR and the old Synaspismos, and is solidly wedded to the radical left currents within it that maintain a strong left pressure on the Synaspismos leadership. While the KKE is under no such left pressure in an organised sense, it is undoubtedly under pressure from its ranks and supporters, and despite its hardened sectarianism, the KKE has often stood out as being quite militant in labour movement politics, as long as it doesn't escape its control. Many among this militant base of the party are unlikely to look kindly on the party playing this sectarian game when the objective need for the left to unite for power has never been greater. This is already in evidence with an opinion poll conducted by Alpha TV less than a week after the May 6 elections, according to which SYRIZA’s vote would increase from 17% to 27%, making it far and away the biggest party, ahead of ND which would be expected to pick up only a couple of percentage points and hover around the 20% mark. By contrast, the KKE vote dipped from 8.5% to 7%, and the Democratic Left was down from 6.1% to 4.9%. It is not difficult to understand what this indicates. However, what of the genuine weaknesses in SYRIZA’s program? Could it be argued that, however sectarian the KKE may have been in recent years, it is right to reject alliance with what it considers a softer-left program as this would compromise their basic political principles? The key issue of difference here is that of attitude towards the EU and the eurozone – the KKE demands immediate withdrawal. As SYRIZA does not, it may be argued that there is simply not enough common ground between the two positions; as the KKE expects any program to fail as long as Greece remains within this framework, it is right to not take part in a SYRIZA-led government. There are a number of problems with this argument. First, unless new elections give SYRIZA the bigger majority as predicted, even now SYRIZA and the KKE could not form a government due to the undemocratic electoral law by which the party with the most votes (i.e., New Democracy in this case) gets 50 extra seats for free. At least they would need support from the Democratic Left, and this organisation is so right wing that it has been courted by PASOK and ND to form a soft austerity coalition to save the memorandum. To its credit it rejected this, given how breathtakingly humiliating it would have been, but the fact that it even took part in such talks indicates how far away it is from the kind of ally that SYRIZA would need. Therefore, the issue is more one of attitude to collaboration. When SYRIZA approached the KKE after the election, the KKE’s response was simply to tell SYRIZA to shove off. If the KKE had a genuine left critique of aspects of SYRIZA's program, it should now be actively putting it to SYRIZA as a basis for discussion to unite the left forces to take power on the kind of program necessary today. The fact that the KKE is not even propagandistically trying to do this reveals the bankruptcy of its sectarianism. The difference between a united left that is capable of taking power after new elections, and a divided left where the idea of actually winning appears hopeless, may well have a big impact on how the desperate masses vote in new elections. Second, given the nature of SYRIZA as described above, many of its constituent organisations actually agree with the KKE rather than the SYRIZA leadership on the EU and eurozone questions, and on a host of other questions are far to the left of Synaspismos, even after the exit of its right faction. If the KKE was a revolutionary organisation, it would be approaching SYRIZA in united front fashion, trying to find minimum points of agreement to fight around, and in the process linking with the left organisations within SYRIZA to keep pressure on the leadership to carry its radical program through, and to push it further to the left. Notably, Antarsya is in agreement with the KKE on the “harder” position towards the EU (but without the KKE’s nationalistic version of this policy), but Antarsya has a good working relationship with SYRIZA, particularly with its more radical components. It is also composed of some 10 groups, most notably NAR (the 1989 left split from the KKE), SEK (the Greek branch of the UK Socialist Workers Party), OKDE-Spartakos (the Greek section of the Fourth International) and EKKE (a group of Maoist heritage). Though Antarsya’s vote was small on May 6, its 75,000 votes are hardly insignificant in an election where, given the actual life and death situation the masses find themselves in, they tended to vote for whichever left party they thought had the best chance of actually defeating the parties of their brutal class enemy. Third, the central points of SYRIZA’s program include outright rejection of the memorandum, a renegotiation of the debt, including abolition of “odious” debt, a three-year suspension of payments, abolition of all measures that have struck at the living standards of workers and the poor, heavier taxation of the rich and a partial bank renationalisation. As minimal as this program may appear, it is simply far too radical for the neoliberal EU establishment; if implemented in full, Greece will almost certainly get kicked out of the EU and eurozone anyway, thus fulfilling the KKE’s agenda. In fact, there are good arguments for doing things in such a transitional way. The same polls showing greatly increased support for SYRIZA, total hostility to the memorandum and continued devastation for the establishment parties, also show an overwhelming majority of Greeks opposed to cutting ties with the EU and the euro. Aside from the question of illusions, there are also good reasons for them to fear the consequences of such a momentous step as withdrawing. The battle needs to be fought politically; clear alternatives need to be presented. While the KKE’s response that nothing will work except abstract “people’s power” may sound good to ideologues, in the absence of actual organs of “people’s power” this rhetoric is just left cover for abstentionism at precisely the time the left needs to offer an alternative program. The main danger is not that SYRIZA would not quit the EU immediately, but rather the temptation for SYRIZA leaders to not carry through their own minimum program under the enormous pressure they would be under. It is thus all the more vital that the other major bloc on the left, the KKE, as well as smaller forces like Antarsya, are actively involved to maintain the pressure on the side of SYRIZA’s ranks and smaller constituents to fulfill its program. Above all, what is needed is sustained popular mobilisation to maintain that pressure, and to involve the masses directly in the process to bring about such an enormous transformation. While the critique that SYRIZA simply wants to “occupy chairs” is being used as an excuse for abstention or sectarianism, it is nevertheless true that a part of the SYRIZA leadership does hold left-reformist illusions, and even more true that, whatever the nature of the leadership, the kind of full-scale anti-capitalist transformation ultimately necessary to deal with this crisis cannot be carried out only in the electoral arena. All the smaller parties of SYRIZA and Antarsya need to take the lead in ensuring continual mobilisation, alongside the ranks of Synaspismos and the KKE, as well as the trade unions and even the traditional base of PASOK, in demanding a left united front to smash the austerity as a minimum program and sustain such mobilisation through the intensification of the crisis that will inevitably result from the collapse of the Memorandum, the exit from the Eurozone and the cut-off of EU cash. The KKE’s idea that it will gain from a “second wind” when the masses see the failure of SYRIZA is almost beyond comprehension in its sectarian reasoning. In a situation that is revolutionary, that is life and death for the masses, the nettle needs to be grasped. More likely a failure of the left to unite at such a crucial moment for Greek society will open the door to fascism as a section of the masses swing right to find an “alternative” to the crisis. The massive 7% vote for the neo-Nazi, immigrant-bashing criminal gang Golden Dawn on May 6, alongside the 10% vote for a right-wing nationalist split from ND, may end up being a signal of the future direction if the left cannot offer an alternative. Those leftists who pave the way for this will be, and ought to be, judged harshly by history.